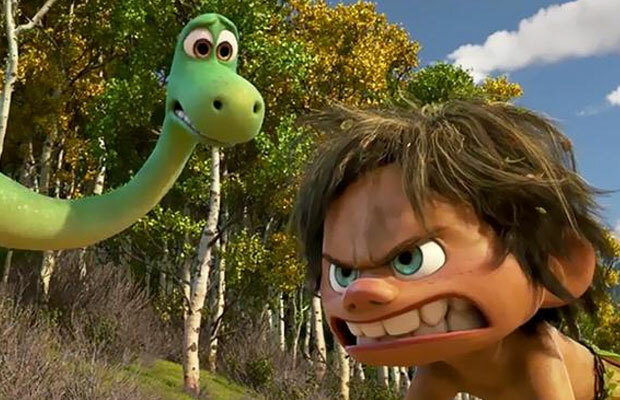 This Cute Trailer Of The Good Dinosaur Will Make You Want To Watch The Movie Now! Disney’s upcoming anticipated film The Good Dinosaur is an adorable take on world where dinosaurs still exist. The second official trailer of the film has been released after a long span and it reveals something that is totally out of the box. Apparently the animated film will see humans as pet dogs of dinosaurs! ‘The Good Dinosaur’ is based on an assumption that the asteroid that wiped off dinosaurs from the face of earth, never hit the planet. The trailer shows the journey of a baby dinosaur who get separated from his father. Thus the film is a journey about how he goes through hardships to reunite with his family. So it is like other way round of ‘Finding Nemo’. During his journey, the little dinosaur meets with a tiny human who looks somewhat like Mowgli. And from what we see, the baby human thinks it’s a dog! Woofing around and walking on all fours, the cute little baby follows the dinosaur everywhere. The trailer is absolutely adorable and you should surely mark your calendars for it! From kids to adults, who doesn’t like Disney movies? Over the years Disney Pixar has given amazing films like ‘Cars’, ‘Toy Story’, ‘Brave’, ‘Finding Nemo’, ‘Monsters Inc.’, ‘Up’, ‘The Incredibles’, ‘Wall-E’, ‘Ratatouille’, ‘Lifted’ and ‘Monsters University’ amongst others. After the possible Oscar contender film ‘Inside Out’, Disney is back to amaze us with ‘The Good Dinosaur’.